High plasma asymmetrical dimethylarginine (ADMA) signals endothelial dysfunction and atherosclerosis in the general population and predicts mortality in ESRD. The relationship among plasma levels of ADMA, renal function, and the risk for progression to ESRD (halving GFR or dialysis start) and death in an incident cohort of 131 patients with chronic kidney disease was investigated. 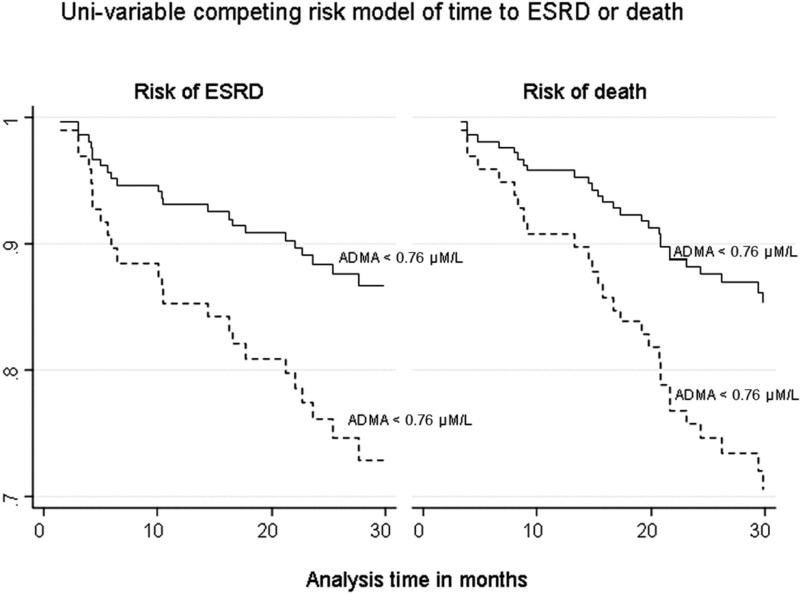 Cox’s competing risk regression was used to model double-failure times (progression to ESRD and death) as a function of ADMA. Covariates that were considered for adjustment included clinical characteristics, baseline GFR (Modification of Diet in Renal Disease equation 7 formula), proteinuria, traditional cardiovascular risk factors, serum C-reactive protein, homocysteine, and concomitant therapies. Mean age at enrollment was 71 ± 11 yr, and 24% of patients had diabetes. Baseline GFR ranged from 8 to 77 ml/min per 1.73 m2 (average 31 ± 15 ml/min per 1.73 m2). ADMA was inversely related to GFR, ranking as the third predicting factor (partial r = −0.22, P = 0.01), after hemoglobin and urinary protein, in a general linear model that included multiple correlates of GFR. After a mean follow-up of 27 mo (range 3.4 to 36), 29 patients progressed to ESRD and 31 died. ADMA (hazard ratio per 0.1 μM/L 1.203; 95% confidence interval 1.071 to 1.350) predicted event occurrence independent of other potential confounders, including GFR, proteinuria, hemoglobin, and homocysteine. In patients with mild to advanced chronic kidney disease, plasma ADMA is inversely related to GFR and represents a strong and independent risk marker for progression to ESRD and mortality. These novel findings further expand the implications of previous observations in ESRD patients and generate hypotheses on the role of ADMA in progressive chronic nephropathies. The endogenous inhibitor of nitric oxide synthase, asymmetric dimethylarginine (ADMA), is now considered one of the strongest markers of atherosclerosis (1). The hypothesis that this substance is implicated in endothelial dysfunction and vascular damage is now supported by a variety of experimental data in animal (2) and in vitro (3) models as well as by coherent observational studies (4,5) and in various disease states (6). Furthermore, in individuals with ESRD, ADMA is a strong and independent predictor of death and incident cardiovascular complications (7). It is well established that hypertension and proteinuria represent the two major modifiable risk factors for renal disease progression and for the high rate of cardiovascular complications in patients with chronic kidney disease (CKD) (8). However, in patients with CKD, those factors do not explain in full these outcomes (9,10). Indeed, recent observations indicate that not only hypertension but also the full series of risk factors that compound the metabolic syndrome, i.e., a cluster of risk factors that are responsible for most cardiovascular complications that occur in the general population, contribute substantially to the high prevalence of CKD (11). ADMA raises arterial pressure (4,5) and is strongly associated with insulin resistance (12), the basic abnormality of the metabolic syndrome. However, there is evidence that ADMA has pronounced renal hemodynamic effects. Continuous ADMA infusion at subpressor doses increases renovascular resistance (13). These functional effects on the renal vasculature are germane to observations that indicate that high ADMA is associated with intimal hyperplasia (14,15), i.e., a widespread alteration encompassing medium and small renal vessels and large elastic arteries as well (16). Thus ADMA may be a mediator of both renal function loss and death in patients with chronic nephropathies. Furthermore, these patients are at risk for both renal function decline and death, either of which may occur first. In these situations, traditional analyses of time to first event only may waste potentially relevant information beyond the first event. On the basis of these biologic and epidemiologic assumptions, we investigated by a competitive risk modeling approach the association between plasma ADMA concentration and both progression to ESRD and death in a well-characterized cohort of patients with moderate to advanced CKD. This cohort study was designed specifically to investigate the impact of nontraditional cardiovascular risk factors on renal function decline and patient outcomes in CKD stages 2 through 5. The study protocol was in conformity with the ethical guidelines of our institutions, and informed consent was obtained from each participant. All consecutive patients who were referred to the outpatient clinic of the Renal Unit of Cremona Hospital from January 2002 to April 2003 were enrolled in the study. Data on baseline characteristics, renal disease causes, previous or actual smoking habit, documented diagnosis of diabetes, cerebrovascular disease (ictus, transient ischemic attack), peripheral artery disease, coronary artery disease (angina or myocardial infarction), heart failure (New York Heart Association [NYHA] > II), chronic lung disease, neoplasm, and history of hypertension (absent, <5, 5 to 10, 10 to 20, and >20 yr) were collected at the first referral and defined on the basis of the diagnosis-related group classification and International Classification of Diseases, Ninth Revision. Patients were subsequently followed regularly with frequency dependent on renal function. BP was measured three times (at 2- to 5-min intervals with a mercury sphygmomanometer), and the average value was considered for data analysis. Drug prescriptions were recorded accurately. Recordings included the use of calcium channel blockers; α and β blockers; diuretics; converting enzyme inhibitors; angiotensin receptors and aldosterone antagonists; statins; α and β erythropoietins and darbopoietin; antiplatelets; digoxin; antiarrhythmic drugs; nitro derivatives; anticoagulants; antidiabetic agents; vitamins D, C, and B; and calcium supplements. All patients were instructed carefully for 24-h urine collection and additional urine spot for proteinuria assessment. Blood sampling was performed after 20 to 30 min of quiet resting in a semirecumbent position. A fasting blood sample for serum lipids, creatinine, uric acid, albumin, calcium and phosphate, C-reactive protein (CRP), total homocysteine (Hcy), and hemoglobin was obtained from all patients at baseline. Plasma was stored at −80°C until analysis. GFR was estimated using the Modification of Diet in Renal Disease formula, equation 7, derived by Levey et al. (17). Plasma total Hcy (Abbott Laboratories, Berkshire, England) and serum CRP (Behring, Scoppito, L’Aquila, Italy) were measured by using commercially available kits. Plasma concentration of ADMA was measured by a well-validated ELISA (DLD Diagnostika GMBH, Hamburg, Germany) (18). The correlation coefficient (r) of liquid chromatography–mass spectrometry ADMA versus ELISA ADMA was 0.98. Intra-assay of this ELISA ranges from 5 to 8%, and interassay ranges from 8 to 10%. Analytical recovery is >90%, and the assay shows no cross-reactivity (<1.5%) between ADMA and l-arginine or symmetric dimethylarginine. Plasma ADMA was also measured in a group of 22 subjects (hospital and laboratory personnel) with normal serum creatinine matched with CKD patients for gender (17 men and five women) and BP (137 ± 8/87 ± 7 mmHg). After the initial assessments, laboratory and clinical data that included cardiovascular events and death and the need for dialysis as a result of ESRD were recorded accurately. For avoiding loss to follow-up, patients were contacted by telephone in case they missed any appointment and at the study end date (January 13, 2005) when their last scheduled visit was before November 2004 and when they were not known to be on dialysis already or have died. Each death was reviewed and assigned an underlying cause by three physicians, on the basis of all available medical information. In cases of out-of-hospital deaths, family members were interviewed by telephone to ascertain the circumstances surrounding the death. ESRD requiring chronic dialysis was diagnosed on the basis of clinical and laboratory data and instrumental findings (shrunken kidneys at ultrasound examination). Data are expressed as mean ± SD, median and interquartile range, or percentage frequency, as appropriate. Variables that deviated from the normal distribution (positively skewed) were log transformed (lg10) before the correlation study. General Linear Model of GFR. Plasma ADMA as well as a series of traditional and nontraditional risk factors for renal dysfunction (including clinical data and laboratory measures described above) were modeled as a function of GFR on the basis of their univariate association or clinical plausibility. Variables that were incorporated into the Modification of Diet in Renal Disease formula, equation 7 formula were excluded from the equation. Data are expressed as correlation coefficients (r), partial correlation coefficients (partial r), and standardized regression coefficients (β). The Cox procedure was used to model time to halving GFR or dialysis start and death as function of ADMA levels. However, because more than one event could occur for the same patient and analysis of time to first event only would ignore additional failures and possibly relevant information in the data, a competing risk model for double unordered failure events of different types (dialysis or death) was fitted (19). In this repeated-event model, each failure event can occur only once per patient; all patients are at risk for both events; and when a patient experiences one of the events, she or he remains at risk for the other (albeit the second failure time is censored when death occurs first). The lack of independence of the failure times was accounted for by correcting the robust variance-covariance matrix of the estimators with the matrix of the independent groups (clusters) efficient score residuals (20). The model was stratified by failure type, allowing each stratum to have its own baseline hazard function but restricting the coefficients to be the same across strata. Furthermore, to control for the effect of GFR on the risk for death, which was a step function of time (i.e., its hazard ratio was identical to that of ESRD for the first year but vanished subsequently), we introduced into the model a death stratum–specific covariate (21). This covariate was set to be 1 after the first year of follow-up for the death stratum and 0 otherwise (21). Covariates that were considered to develop the survival model included all traditional and emerging risk factors previously described. The largest possible meaningful model considered included clinically consistent variables and interpretable interaction terms identified on the basis of biologic plausibility or strength of their univariate relation to the outcome, following the rule of 10 (one parameter per 10 events) and considering the overall model fit and hazard proportionality. A manual hierarchical elimination approach was followed, monitoring variations of the exposure regression coefficient to identify variables that were eligible to be dropped as nonconfounders. Analyses were performed using STATA 8.2 SE (Stata Corp, College Station, TX). Table 1 presents the demographic and the baseline characteristics of the study cohort. The study population had an average age of 71 yr (SD 11), 62.6% of the patients were male, 24.4% had diabetes, and 57.2% had background cardiovascular complications. Baseline GFR was 31 ml/min per 1.73 m2 (range 8 to 77 ml/min per 1.73 m2), and serum creatinine was 2.4 mg/dl (range 0.8 to 7.2 mg/dl). In general, nontraditional risk factors (albumin, hemoglobin, CRP, and Hcy) were more markedly deranged than traditional risk factors. In this cohort, plasma ADMA (0.78 ± 0.17 μMol/L) was significantly higher than the average plasma concentration in healthy subjects (0.69 ± 0.10 μMol/L; P < 0.0001). On univariate analysis, the estimated GFR was related directly to hemoglobin (r = 0.41, P < 0.001) and inversely to plasma ADMA (Figure 1), urinary protein (r = −0.42, P < 0.001), calcium phosphate product (r = −0.37, P < 0.001), Hcy (r = −0.34, P < 0.001), CRP (r = −0.17, P = 0.05), uric acid (r = −0.17, P = 0.05), and diabetes (r = −0.23, P = 0.007), but it was independent of BP and number of antihypertensive drugs, previous cardiovascular events, body mass index, albumin, total and HDL cholesterol, and triglycerides (r ranging from 0.01 to 0.16, P > 0.07). In the general linear model of GFR, plasma ADMA proved to be the third factor in rank, after hemoglobin and urinary protein, to explain the GFR variability (Table 2). Of note, this multivariable model explained approximately 50% of the total variance of estimated GFR. Relationship between plasma asymmetrical dimethylarginine (ADMA) and estimated GFR. During the study period (mean follow-up 27 mo; range 3.4, 36), 29 patients fulfilled the criteria of ESRD progression (25 patients started dialysis, and four patients had a reduction of GFR to values lower than half of their baseline measure), 31 died (61% as a result of cardiovascular complications, 16% as a result of infectious diseases, and 22% as a result of malignancies or cachexia), and eight entered regular dialysis treatment before death. Table 3 summarizes the unadjusted hazard ratios for the study outcomes associated with ADMA and traditional and nontraditional risk factors. In this crude analysis, ADMA, baseline GFR and proteinuria, hemoglobin, and calcium-phosphate product were associated with adverse events, whereas serum albumin, Hcy, and CRP failed to reach statistical significance. Traditional risk factors; comorbid conditions, including diabetes, neoplasm, and cardiovascular diseases; and current specific and multiple treatments were not found to be significantly associated with the study outcomes. At univariable analysis (Figure 2), patients with ADMA levels below the median (0.76 μM/L) had significant survival advantage in both event-specific strata, i.e., death and progression to ESRD (P < 0.001). Survivor functions (Cox regression analysis) stratified by event type taking into account patient identity only. The hazard ratio (HR) associated with a higher level of ADMA (ADMA ≥0.76 μM/L versus ADMA <0.76 μM/L) was 2.20 (95% confidence interval [CI] 1.20 to 4.04; P = 0.011). Results of multivariable analysis are summarized in Figure 3. Increased ADMA levels predicted higher risk for event occurrence (20% per 0.1-μM/L increase in plasma level), independent of proteinuria and GFR. Each g/L of proteinuria was associated with a 32% increased risk for both dialysis and death. The parameter estimates of ADMA and proteinuria were the same in both strata, and their effects were time independent. The same applied to hemoglobin (23% reduced risk per g/dl) and Hcy (9% borderline significant higher hazard risk per 0.1 μM/L). Higher baseline GFR reduced the risk for both event types for the first year of observation (relative risk 9% lower per each ml/min per 1.73 m2) and similarly the risk for ESRD also after the first year. None of the remaining risk factors, including comorbid conditions, age, BP values (systolic, diastolic, and pulse) and antihypertensive drugs, calcium and phosphate product, serum albumin, and CRP as well as their variation over time had any significant effect or modified the estimates of the covariates of the final model. Results remained materially unchanged when progression to ESRD was defined as dialysis start only and the four patients who halved their GFR were censored. HR and 95% CI for progression to ESRD and death associated with the covariates in the final competing risk model. ADMA, baseline proteinuria, hemoglobin, and homocysteine (Hcy) were time-independent covariates (i.e., the associated HR remained constant during time). Methodologic details on model building are reported in Materials and Methods. This study shows that ADMA is an independent predictor of progression to dialysis and death in patients with CKD. CKD has assumed epidemic proportions in the Western, affluent societies and now represents a leading cause of death. This is due to progression to ESRD and to the high mortality associated with renal insufficiency. Indeed, it now is evident that in patients whose kidney disease does not progress to terminal stages, the presence of renal damage, signaled by proteinuria and by a reduced GFR, is associated with a substantially increased risk for death from cardiovascular disease. As a result, renal insufficiency now ranks as an independent risk factor for cardiovascular disease in the most recent guidelines issued by the Joint National Committee (22) and by the European Society of Hypertension (23). Although observational and interventions studies have firmly established a role of hypertension in renal disease progression (8) and in the high cardiovascular risk for patients with CKD and identified proteinuria as a causative mechanism of renal damage and as a marker of cardiovascular risk (24), it is widely perceived that these factors alone do not completely account for the epidemics of CKD and the accompanying high rate of cardiovascular complications. In this perspective, evidence has been accrued recently that the link between cardiovascular and renal diseases in large part derives from the fact that both the cardiovascular system and the kidney are common targets for classical risk factors. Beyond these risk factors, further research in this area is believed to be of paramount importance, and special reports from the National Kidney Foundation (25) and the American Heart Association (26) have formally recommended a new wave of cross-sectional and longitudinal studies aimed at identifying new environmental and genetic risk factors. The endothelium plays a crucial role in the maintenance of vascular tone and structure. One of the major endothelium-derived vasoactive mediators is nitric oxide (NO). ADMA is an endogenous competitive inhibitor of the enzyme NO synthase, a core element in the regulation of this system. Remarkably, ADMA inhibits vascular NO generation at concentrations found in pathophysiologic conditions (27). This substance is synthesized within endothelial cells, and it is held that its interference with endothelial NO synthase at tissue level is even more marked than reflected by its plasma concentration (27). Although direct evidence linking ADMA levels and NO synthesis in vivo in humans is not available yet, ADMA causes local vasoconstriction when it is infused intra-arterially (28), and two recent studies have demonstrated coherently that this substance has a sustained pressor effect when infused intravenously in healthy humans (4,5). Plasma ADMA levels are increased in a variety of diseases, including atherosclerosis, hypertension, chronic renal failure, and chronic heart failure (1). In renal failure, ADMA accumulation only in part depends on compromised excretory function in that it was shown that reduced dimethylarginine dimethylaminohydrolase activity may contribute substantially to ADMA accumulation (29). The wide-range involvement of ADMA in the atherosclerosis process is epitomized by recent in vitro findings indicating that ADMA contributes to macrophage lipid accumulation, which is a critical step in the formation of fatty streaks during atherogenesis (30). In this cohort, the vast majority of deaths (61%) were cardiovascular in nature. Remarkably, ADMA predicted death independent of hemoglobin, GFR, and proteinuria, and the estimate of the risk associated with increased ADMA (20% for each 0.1-μMol/L increase in plasma ADMA) was unaffected by adjustment for traditional and nontraditional risk factors. Thus, our data extend to CKD findings in ESRD indicating that ADMA is a strong predictor of death in patients with renal diseases. Although atherosclerosis is the most emphasized potential effect of ADMA, beyond this mechanism, ADMA-induced NO inhibition has other effects that may be conducive to death in patients with ADMA accumulation (31). Plasma ADMA is sensitive to salt loading (32) and causes salt retention (13). Indeed, in salt-sensitive individuals, it increases during salt loading (32), and such an increase is closely associated with a measurable decrease in plasma NO. Likewise, changes in plasma ADMA are associated with the pressor response to high salt intake in postmenopausal normotensive women and explain as much as 16% of salt-induced changes in arterial pressure in these individuals (33). As alluded to before, there is solid evidence that ADMA interferes with renal function in humans. Indeed, it causes significant renal vasoconstriction without modifying the GFR, thus generating a hemodynamic setting indicative of glomerular hypertension (13). In our study, we found that ADMA was inversely related to the GFR and that it predicted progression of renal disease to dialysis. Thus, it is conceivable that the accumulation of this substance at the renal level engenders and/or potentiates microvascular damage and nephron loss, a possibility in line with the renal hemodynamic effects of this substance. As in this study, ADMA was inversely associated with the GFR in a recent study in a young cohort of patients with early diabetic (type 1) nephropathy, and an increase in plasma ADMA was detectable early in the course of the diabetic kidney disease, when GFR was still within the normal range. Increased ADMA concentration in individuals with type 1 diabetes was associated with evidence of atherosclerosis but did not predict subsequent decrease in renal function (34). Mechanisms that are responsible for renal disease progression in diabetes do not coincide with those in nondiabetic nephropathies, and high ADMA in young individuals with diabetes may not be a major trigger of progressive renal dysfunction. Our study has limitations. First, it was a single-center study. Confirmation in other cohorts is necessary to give external generalizability to our findings. Second, the average age of our cohort was 71 yr. Although this fully reflects the progressive aging of the population of individuals who have CKD and are referred to renal clinics (35), our findings may not apply to younger cohorts. Third, our cohort was relatively small, and the number of events recorded during the study was limited, yet our statistical approach modeling competing risks and considering multiple outcomes was powerful enough for establishing an independent association between ADMA and death and the renal outcome. This analytical strategy was dictated by background physiopathologic and epidemiologic knowledge previously discussed, mainly the potential involvement of ADMA in mechanisms of both renal disease and death. In this respect, robustness of findings under the assumption of similar effect on both outcomes seems to corroborate biologic data (19). In addition, it should be emphasized that appropriate multiple-failure time analyses (i.e., accounting for the correlation within the data) offer more relevant information than time to first occurrence only, particularly when patients under study are at risk for more than one event (20). Our analysis suggests that among nontraditional risk factors, also inflammation and Hcy may be related to death and progression to dialysis, but the issue deserves further study in larger cohorts. Finally and most important, there is still no proof that modifying ADMA produces better cardiovascular and renal outcomes in CKD. Our data further underscore the need for intervention studies to establish whether ADMA is a causative factor in the high death rate and progression to dialysis of patients with CKD. Endogenous Nitric Oxide Synthase Inhibitors in the Biology of Disease: Markers, Mediators, and Regulators? A New Perspective for the Treatment of Renal Diseases? Letter by Kielstein et al Regarding Article, "Renal Function as a Predictor of Outcome in a Broad Spectrum of Patients With Heart Failure"